In the late 70’s, William’s Grandparents got the racing bug. (this is where some of the older race breeding has come from in the program.) As well, William’s dad has always team roped and liked fast horses! Horses have been a mainstay on the Beierbach ranch with William’s parents keeping close to 100 head at times. Donna grew up on a cattle ranch in northern Saskatchewan. Also from a family with a long 'horse-history' (her great grandfather - Samuel James Walker - ran a riding stable in Saskatoon, SK and owned two livery barns in Plato and Wartime), Donna was on the back of a horse since her earliest memories. While growing up, she competed at gymkhanas, horse shows and high school rodeos. Donna's Dad rodeoed; hewould ride the odd horse for others and always broke and trained his own for the ranch. It was Donna's Dad who taught her most of the 'basics' about horses! 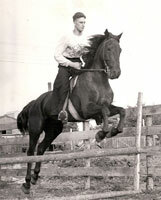 He coached the young horsewoman from the outside of the roundpen in the early going. Once out of high-school, Donna started accepting outside horses to break and train. William and Donna were married in 2000. 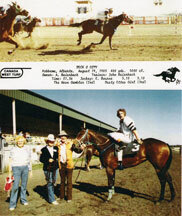 The couple purchased a stallion IT SASKINIC to cross on the race bred mares hoping to raise ideal arena horses. (got too many fillies!) Nic is now a finished calf horse… and a gelding. Longtime friend and respected horseman, Ross Brigden put together an incredible 'package deal'’ on some mares in spring of 2008. From there, we decided to do some specialized breeding. The Beierbachs have also bought several other prospects from Ross over the years. He has an incredible eye for a horse and knows what makes a winner! He found the stallion Oh Poppy for the Beierbach family as well. The Beierbachs do things the cowboy way on the ranch - from the back of a horse - endless hours of moving , sorting, doctoring and checking cattle. From brandings in the spring to weanings in the fall… the 1 Y quarter horses get to see what a real days work is all about and gain valuable experience while doing the day-to-day jobs on the ranch.